You are The Dark Overlord, and the ritual is complete. At your command, the Covil rises. A living and breathing fortress now profaned by the greed crystals. Inside its dungeons lies the gate to the dark lands where countless hordes of chaotic beings were enslaved for so long. This time you will have your revenge. 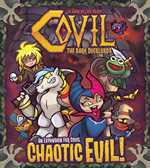 In Covil: The Dark Overlords, you will struggle for the supremacy of the regions surrounding an isolated town. Each player controls a Dark Overlord with unique powers and countless troops of minions to ?defend the world from enemy hordes?, bring ?peace and security to the territories? ? at a cost, of course! At the end of the fourth night phase, the game ends. The player with most victory points wins. Finally, a sticker sheet is also included to decorate the meeples in the game! It is time to get serious in your quest for dominance over the territories. 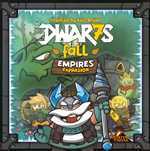 With this Expansion, you can increase your playtime with the epic Mercenaries, add many more strategies and increase the challenges of being an Overlord. Personal "Sinister Plots". These are essentially secret goals/missions that award you Relics. But they aren't alone in this fight... from the bottom of the crystal caves, one more dwarf king emerges. He's vengeful and some say that he can lure the fearsome frost giants! The Empires Expansion introduces 3 new player characters allowing you to play from 2 to 7 players! The expansion adds more strategies, secret goals, scenarios and of course more custom meeples to the game! 54cm x 54cm Neoprene Playmat.